This entry was posted in All and tagged critical thinking, Google, kids, learning, lex, marino, Pedagogy, problems, questioning, solving, teaching, thinking by Alec. Bookmark the permalink. At the same time, though, I think the struggle you describe (that is, fighting against the “let’s go to Google and answer this question RIGHT NOW” tendency) is one of the first struggles we as a culture need to address to become wiser about tech. If we can learn how to not immediately seek the oracle for the answer to every question, or if we can delineate which types of questions it makes sense to do that for and which ones not (and all of the related issues; for example, should 5-year-olds use Google? 8-year-olds? 10? 12? ), we will be taking big steps towards the truly mindful use of technology. I appreciate your own mindfulness about its use, and will continue to try to do the same! Thanks, Mike. I think the patience you describe is key to all of this. I remember hearing a comedian a while back discuss the difference between knowing and not knowing as being close to nil as the answer was never more than seconds away. I’m beginning to miss the state of ‘not knowing’ when it comes to easy, factual knowledge. Of course, as you suggest, some of the same conditions may not apply for some deeper knowledge. You should have a look at the photo and ask “why do you think they grow that way?” Banana’s are interesting because ammung the thousands of varieties available we (in western society) rarely have access to more than the 1 type currently being grown, which has changed since the Cavendish (looked that up on Wikipedia although I knew it already) was killed off by panama disease. Neat idea that an entire fruit that you enjoy is different from the one you grew up with and your children have never likely tasted the variety that we used to eat. I also wonder if our capacity to recall information is being slowed by Google. You know, when you are trying to think of that actor’s name, or who sang a particular song. The temptation to just Google for the answer, instead of using our memory is so strong. Does it really matter, though, that we don’t exercise our memories as much, when the answer is easily accessible? I’ve felt this, but I just attributed to getting older. But you’re right, “does it really matter?” is the hard question. I imagine this being a huge conversation for our next few generations. I can’t see how the absolutely wonderful ability to access basically the entirety of human knowledge hampers curiosity. If anything, it supercharges it. We stand on the shoulders of giants. Every answer leads to a million new questions. Your son’s generation will be hyper-accelerated thinkers, not less curious. The mistake, I would say, was in not handing the phone to your son for him to find the answer. Thanks for the resource – will take a look. I don’t believe that it is in the access to information that is the problem here. Rather, it was that gut response to simply hand-over the answer rather than to instill questioning and inquiry. Regardless of the amount of information available, these characteristics are part of a vital mindset for seeking and negotiating new knowledge. It’s important that we nurture these in our children. I agree that we need to foster HOW to think and HOW to find answers — but not necessarily HOW to recall them from memory. So I agree that there is nothing inherently wrong with “Googling” something as a path to a solution. How is it any worse than when I am coding a computer program and don’t quite know the syntax, or need an example, and I look in a book? Or check a forum? However, having said that, I agree with Alec in the sense that it should not be our “first response” — first response should be our brain. Additionally, inquiry is what science is all about, and if there’s one thing our youngest generation needs to solve the problems of today, it is a more scientific mindset (observation… hypotheses… “educated guessing”). Of course, there’s nothing wrong with demonstrating the tools used to acquire knowledge you don’t currently have, but a Socratic method would have been much more effective: “I don’t know how bananas grow. How could we find that out?” That would’ve gotten the gears going. Maybe the answer would have been “Hey, use your iPhone & Google”… maybe not. But the important thing is that it would reinforce the idea “Here’s a problem. I need to figure out how to use my brain to solve it.” Even if that solution means deciding on which tool to use to find the knowledge you need. In today’s world, I think learning HOW to learn and HOW to find knowledge is far more important than having the knowledge readily available in your head. Then again… do you want to wake up from anesthesia in the middle of surgery to find your doctor with iPhone in hand and Google at the ready? I respect your questioning here, but doubt you have much to worry about. Your son demonstrated curiosity by posing the very question. If you did not generate this kind of environment for him, he might not be noticing, and his freedom to ask the question is worth celebrating. And yes, it could have been an extended learning opportunity to come back to him with the followup question. I would guess you do this more often than not. I do not see a problem at all with looking up the answer… in previous generations, parents often ended up making up the answer. Is that better? I see no problem with looking up answers. I really do not need see a total recall of banana trivia and movie/actor data. What needs to be cultured are the processes of asking and questioning the answers. It’s not that “google provides the answers” but whether we interrogate that and ask if it make sense. Or if there are other possibilities. Or can we make up an interesting story/song as a response? I often have said to teachers that this is really the first generation who never has the right to say “I don’t know.” Your son got the answer he was curious about and you could have had more conversation. However, the bigger issue is how do we as parents and educators help kids learn how to search for the answer, how to evaluate the answers and how to assimilate the knowledge. This is an interesting conundrum now. In 5 years when we are all equipped with Google Glass and our lives are filled with augmented reality, that banana tree picture would already be in your son’s peripheral vision. Then how would you engage him? I think it’s neat that you thought about this. 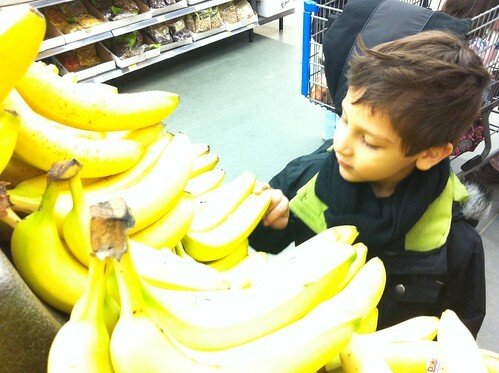 I think it’s neat that your son asked about the bananas at all – it’s not something I would have asked as a child. I don’t have kids or work with kids, so I can’t even say that it’s something my kids would ask about. Curiosity is important – we have to be curious about the world around us. I like Cogdog’s reponse – years ago, he’s right – parents would have made up an answer or said “I don’t know – ask your mom.” Right now, you have the opportunity to teach your son something new, even if you didn’t question him further. I think you did a great job of taking advantage of that opportunity. Just realized that you guys celebrate your “thanksgiving” a bit earlier, don’t you? Haha… In that case, happy belated Thanksgiving :). When I asked that very same question my Granny sent me a banana tree postcard from Florida a few months later…. And I still remember this vividly. I just mentioned this on her obituary page. By the way… About bananas…. when we lived in Ghana we used to take our girls to the banana store on our street where there were many choices of types of bananas. They didn’t look as pretty as the lovely yellow bananas I buy in Canada but man, were they ever delicious ripened on the tree instead of during transit. I really don’t think that looking up an answer stifles curiosity either. Isn’t the nature of curiosity to look for answers, not avoid them? And no, I don’t think this is the first generation with no right to “not know”. There are infinite things we don’t know the answer to, thousands of scientists looking into millions of questions about the “factual world”, let alone thinking beyond the limits. Wasn’t it Einstein that said why remember something if you can look it up? I think you were right to model using a reference tool (when I was 5, my parents would have steered me to a dictionary or an encyclopedia) to answer questions. You also modeled “Dad doesn’t know everything, he has to look it up too”… ie you modelled your own curiosity (instead of nipping it in the bud with “who cares” “why do you ask such silly questions” or changing the topic) and the desire to satisfy it by looking it up. And as others here have noted, you could then ponder on “it grows with the points up, I wonder why that is so?” or “why don’t bananas grow here?” or “what makes bananas so slippery when you step on them?” or any of another gabazillion questions. One answer doesn’t the end of the inquiry make. :) Next: what would be needed to grow bananas on a space ship to the next galaxy? …. Tough call on this one. There’s no doubt that having answers right at our fingertips can stifle thinking — the urge to “avoid sharing” the right answer as an educator has been one that I’ve long struggled with. That I can answer my own questions immediately (most frequently, “Where have I seen this actor before?”) on a day to day basis, however, informs making connections and building up a bigger understanding. That we develop habits of mind that do not stop the learning inquiry process right with the receipt of the Googled answer is what I think you are getting at here. How can we be mindful in our use of readily accessible information (be it from Google, a book, or another learner) so that we can carry on with another/larger question or understanding?